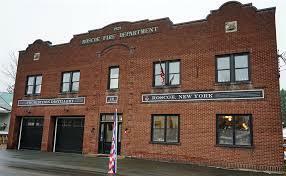 Located in the historic town of Roscoe, New York, our distillery was inspired by the history of the United States, the peoples will, and the art of libations itself. For it was on the fateful day of January 16th 1920, when the 18th Amendment was enacted and outlawed the sale of liquor, that the heyday of American spirits was born Within a few short weeks, underground networks were fully operational, supplying booze to every corner of the United States. Those suppliers, known as Bootleggers, risked everything to whet the appetite of a nation suddenly gone "dry". Their customers were everywhere, they were the politicians, parents, teachers, and local businessmen who, when told by their government they could no longer have a drink, decided to take matters into their own hands and source liquor from those crafty suppliers. Even the five U.S. Presidents who served our nation during Prohibition kept an ample supply on hand at the White HouseThis period in American history brought many freedoms to the forefront. For the first time women were allowed to drink publicly alongside men in these illegal bars, more commonly known as "speakeasies". Six months into this prolific period women victoriously earned the right to vote under the 19th Amendment.